Of all the punk bands that I’ve seen forming in Salt Lake over the past few years, I notice that they either A) fall into the category of “it’s been done,” or B) have a style so outlandish that their influences are practically impossible to pinpoint. CVPITVLS fall into the latter. I recall their previous release, the Quickie EP, with songs that had so much going on but if you blinked you missed them. 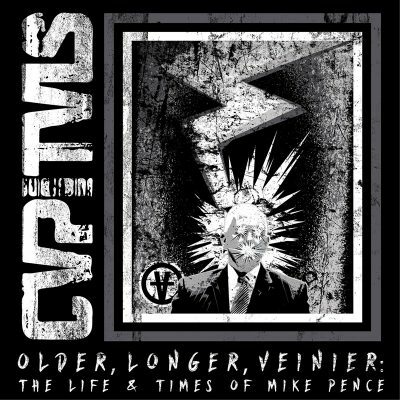 That notion still carries into their seven-song album, the inquisitively titled Older, Longer, Veinier: The Life and Times of Mike Pence. The songs on this album are significantly longer (even a few seconds is enough headroom for a punk song). However, the sound is still the eclectic mixture of fast three-chord riffs, gang vocals, breakdowns and Matt Bennet’s piercing vocals—going back and forth from rabid barking to Biafra-esque talk-singing and never short on snide remarks. The album is jam-packed with off-kilter humor jabbing at societal defects to intrapersonal conflict: “How does your head fit inside that hat with all that ego inside of you” (“Makin Bacon”), “People look at me and they wrinkle their nose / I may stink but I’m not weak” (“Up”), and “Shot, shot, shot, now the world’s problems seem so far away!” (“Whiskeyed”).